How Should You Prepare Your Yard for a Fire Feature? Preparing your backyard for a fire feature can save you a load of headaches later on. Fire features are a wonderful way to add some practical flair to your yard. They’re also the perfect addition to your outdoor living space for the winter! Before you invest in your new fire pit or fireplace, you should make sure that you know what you’re getting into and how to handle your yard’s new addition. 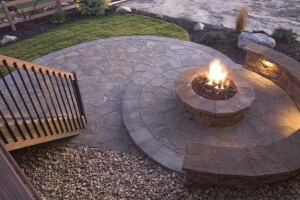 Today we’re going to be taking a look at how you should prepare your yard for a fire feature. Make sure your fire feature is in line with your county’s codes. Check in with your homeowner’s society to make sure that there are no laws restricting or banning fire features before you invest in one. These laws can range from restricting the type of feature to their location in terms of buildings and other structures. In some situations, a permit is required before building the fire feature. Make sure you place your fire feature in the best possible spot. Windy conditions can turn a fun night into a dangerous one. You should make sure that you’re placing your new fire pit in an area that won’t be caught in huge gusts of wind. You should also take care to ensure that there is nothing flammable around your fire pit like trees or other yard debris. Not only will these potentially ruin your evening, but they are unsightly. One of the reasons you may choose to invest in an outdoor fireplace or fire pit is to add value to your home. You wouldn’t want to ruin that by placing it in an unappealing spot. Before your fire pit is completed, you should take the time to assess your risks. Invest in proper equipment for putting out and containing flames in the event of an emergency. A fire extinguisher is an absolute must. At Paradise Pools, we are committed to your happiness so you can be sure that we will get the job done to your satisfaction. Our talented team will go above and beyond to ensure that we create a fire feature that you adore and truly suits the needs of your family and property. We specialize in providing expert craftsmanship and dedicated customer service, so you will always be taken care of when you work with Paradise Pools. Follow us on Facebook, Twitter, Pinterest, Houzz, and Google+. This entry was posted on Friday, December 9th, 2016 at 4:05 pm. Both comments and pings are currently closed.